Meet Mrs Noteworthy, my latest creation...... She is little ( 5" ) a stump doll(free standing) She wears a dress with a music note pattern, pearl earrings and necklace, along with another pendant she always wears which was a gift from one of her music students. 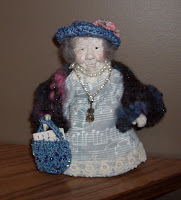 Her tote and hat are hand crocheted in a pretty shade of blue(her favorite) and over her shoulders she wears a hand felted wool stole. Those old bones need warmth even on the sunniest summer day. She will be off to lunch on Saturday with some dear friends.I just know she will be the centre of attention.... She loves that. She will shower us with wonderful stories of her days at the Music Academy and of the time she spent with the New York Symphony where she played violin. Everyone is amazed that she still plays even tho she just celebrated her 98th birthday. Her fingers are knarled and stiff but she can still make those strings sing! Oh I DO love Mrs.Noteworthy!! She will raise the TONE of your group, and Sound a warning if things get too raucus. Have FUN!!! She is just so cute! You did a wonderful job! Mrs. Noteworthy is simply adorable. I think you have out done yourself this time. I dearly love figurines and she is simply the best. Did you make her head and body. The lines in her face are great. I love everything about her. So vintage, she is darling! Oh! Her face is precious!!! I am so happy Mrs. Noteworthy has appealed to you all. She really does have a sparkly personality. Thank you for visiting. She was so excited and has chatted non stop since you were here! so she will stand on her own. Mrs. Noteworthy has personality plus! I love the story of Mrs. Noteworthy and so happy to meet her. Oh this is fabulous!!!! You are so talented!! !